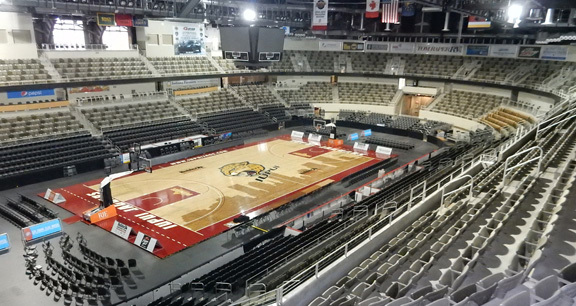 Project obstacles and solutions: The Indiana State Fairgrounds Coliseum was built in 1939 and served as a popular venue for sporting and entertainment events. In 2012, it was announced that the facility would undergo $63 million renovations to gut and rebuild the arena and add a second ice skating rink. Hunt Construction Group was named as the general contractor on the project. Verkler Construction was hired to do the concrete work on the two ice skating rinks and the main area floor. Gibraltar Construction was hired to rebuild all of the seats, stairways and concourse areas. The work on the ice skating surface was unique to most concrete slab pours. Since there are cooling tubes running through the concrete, special consideration had to be paid to the mix design. Any time you have piping running through a concrete floor, there is the potential for shrinkage cracking where the concrete covers the pipes. The job specifications called for the pipes to be held in place with a specially designed chair. Then the floor was reinforced with rebar on 10" and 12" centers. This was then covered with a wire mesh that was tied to the rebar. IMI QC/QA used a mix design that incorporated an 8 inch slump to keep the concrete workable and filled all the voids around the reinforcement. The specs were tight on this job. There was to be no more than 3/4 inch of concrete placed on top of the cooling pipes. When the concrete was still plastic, compressed air was blown through the pipes to check for leaks. The other factor in the slab was the flatness of the surface. The FF numbers were specified at 65 and the FL at 40. This required a concrete mix that would not curl. IMI QC/QA did extensive testing prior to the pour. Verkler was able to meet and exceed FF and FL specs. Beyond the arena, Gibraltar formed up and poured all of the seating areas, stairs and concourse areas. The building was brought up to code with ramps and elevators. The walkways, restrooms and vending area floors were poured using imix Spectra Canyon Clay colored concrete. The color was integrally mixed in the concrete and finished using a hard trowel finish. In total, IMI provided over 6,500 yards of concrete for this project. It was awarded the Indiana Ready Mix Concrete Association (IRMCA) 2014 Outstanding Concrete Achievement Award for a Commercial/Sports Facility.